Set on opposite sides of the Pearl River Delta, Hong Kong & Macau's city, coastal and countryside venues provide inspiring settings for events. A ten-minute drive from Hong Kong’s central district is the Hong Kong Convention and Exhibition Centre, a distinct, undulating structure where most of the city’s exhibitions and conferences take place. Planners have begun to use space at Kai Tak Cruise Terminal – formerly the city’s international airport – across the harbour in Kowloon Bay. The terminal’s ground floor has two expansive baggage halls spanning 3,000m2 which lead onto an 800m apron. The terminal’s long runway is ideal for car launches and has panoramic views of the city and harbour. 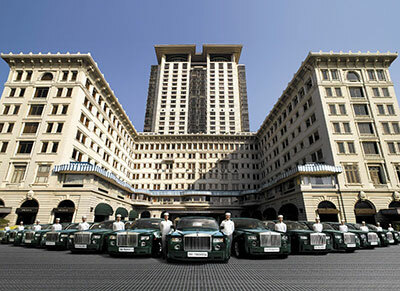 Further east on Kowloon side is The Peninsula (below), Hong Kong’s oldest hotel which opened in 1928. The Salisbury Room’s chandeliers set the scene for grand events, with a ballroom that seats 192 banquet-style. Back on Hong Kong Island, the trendy district of Sai Ying Pun is home to Spanish gin bar Ping Pong 129. The name gives away the space’s former life as a ping pong parlour, though today private events enjoy the bar’s modish design and vast gin selection. Touted as the region’s first ‘cinematic-themed’ integrated resort, Studio City Macau is a one-stop shop for incentives. With 1,600 rooms, large-scale groups can take advantage of 4,000m2 of function space, a resident magic show and the regional iteration of world-famous Pacha nightclub. Nestled on Pui O Beach on Lantau Island, Mavericks is one of Hong Kong’s more fashionable beachside hangouts. Surf paraphernalia and barefoot waiters complete the bar’s laid-back feel, though the menu takes itself more seriously with a range of gourmet bar snacks and inventive cocktails. Further east on Lantau is Discovery Bay, and home to the 325-room Auberge Discovery Bay resort. A favourite with guests who prefer island life to the frenzy of Hong Kong Island or Kowloon, the resort offers venues with oceanfront views and the option to host events outdoors on nearby Sam Pak Beach or at the hotel’s Marine Terrace or Chapel Piazza. 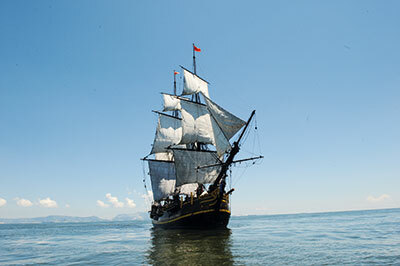 A seafaring option is on offer thanks to The Bounty (below), Hong Kong’s only European tall ship, which starred alongside Mel Gibson and Anthony Hopkins in the 1984 film The Bounty. Run by the Auberge, the vessel can be chartered for product launches, training days and tours of Victoria Harbour. Macau’s glitzy Cotai Strip is a far cry from historic Taipa village on the peninsula’s southern tip, where the Grand Coloane Resort offers a quaint beachside retreat. An 18-hole golf course, mountain biking and paddle boarding are popular with delegates either side of meetings, which can be held on the resort’s lawns looking out to sea. A visit to European restaurant One Thirty One is worth the half-hour journey north of Hong Kong Island into the countryside of Sai Kung. Housed in a three-storey terracotta-stained residence, the restaurant offers fine dining with outdoor seating looking out to Mirs Bay and Mainland China. Further north towards the Shenzhen border, the 427-room Hyatt Regency Sha Tin organises cycling itineraries for groups along Tolo Harbour Cycling Track, which runs through the quintessentially Chinese Tai Po Market and offers striking views of Pat Sin Leng mountain range. The hotel’s afternoon tea buffet is highly regarded by locals while Sha Tin 18 is touted for its fine Chinese fare. 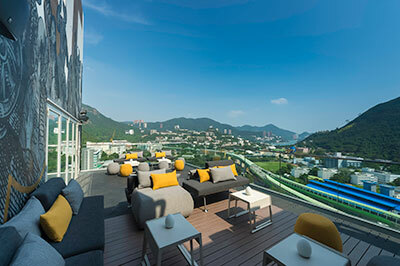 For cocktails, design hotel Ovolo Southside’s rooftop bar Above (below) provides sweeping views across the greenery of Aberdeen and Wong Chuk Hang on the south of Hong Kong Island. Littered with plush sofas, Above’s outdoor deck is ideal for a pre-dinner reception before descending to Cirqle restaurant for a range of Mediterranean-meets-Asian dishes. Event and training facilitators Team Building Asia have created a digital treasure hunt through its Go Team app. Through GPS-triggered challenges, participants are posed questions on local icons, giving teams the chance to engage with each other and get to know the history of their surroundings.